I’ve been suffering a garden identity crisis throughout the last few summers, craving more flowers, more beauty, more vistas, yet wanting to grow edibles in a big way. What’s a garden boy to do? Enter the full-frontal vegetable gardening approach. Now, believe me, I find a traditional, full-on vegetable garden beautiful. You know, the square plots of tomatoes, cucumbers, and corn, bordered by marigolds, often tucked in the back corner of the yard. 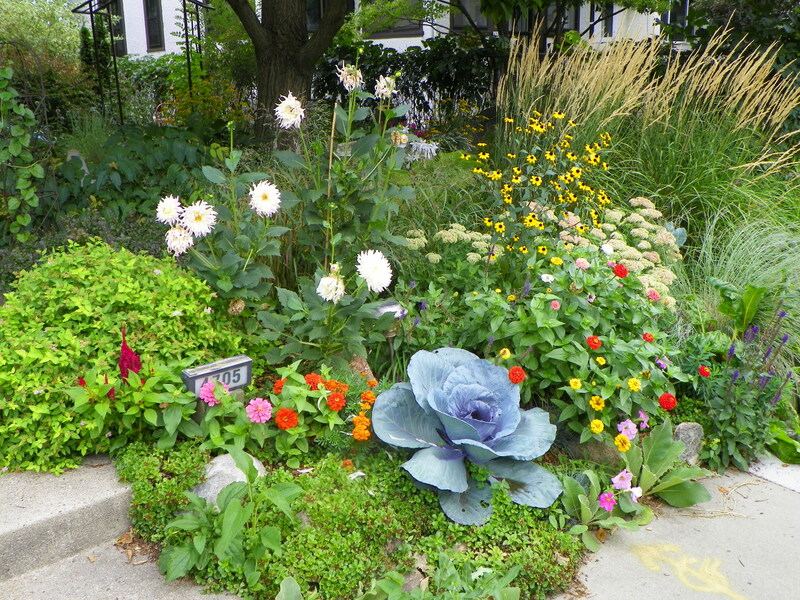 But, I also find veggies so lovely, I want them scattered throughout my ornamentals, where I can see them and enjoy them. Plus, as a tree-addicted urban forester, I am in the constant search for pockets of sun in my overplanted city lot for my vegetables of choice to bask in. Red cabbage is a stunning veggie and a wonderful entrance plant. They really come into their own in the fall. Full-frontal vegetable gardening is the art of bringing edibles out of the shadows of the garden and placing them front and center. It is also the act of searching out the little shafts of light that create full sun pockets in your growing spaces. Look for the area where the sun creates a circle of light, like a spotlight shining down on a stage, putting a cabbage or cauliflower or beet patch center stage. 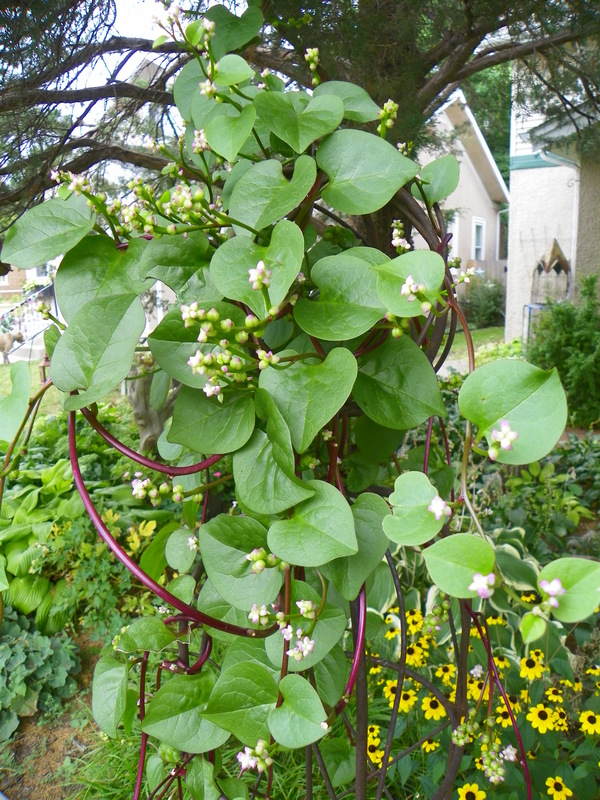 Red Malabar or vine spinach, Basella alba ‘Rubra,’ is incredibly ornamental and magically delicious. 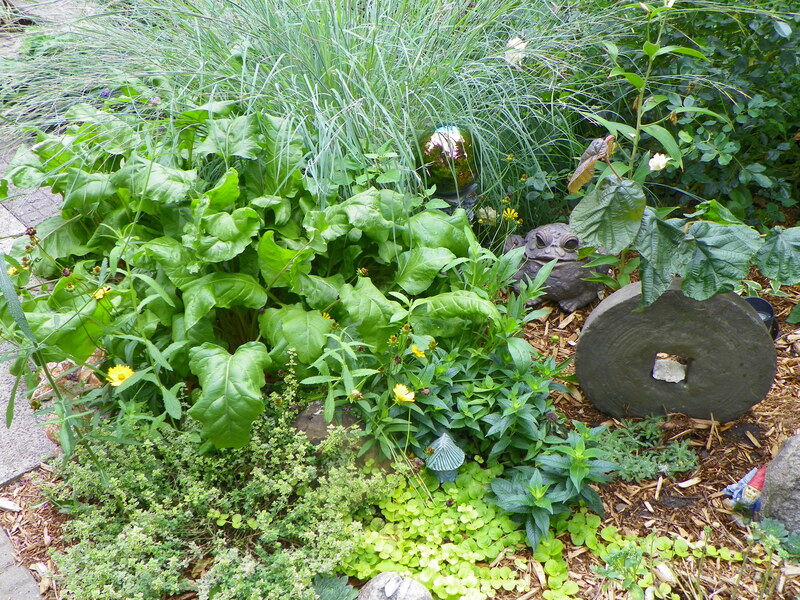 It’s actually not true spinach as we know it, which works well in the full-frontal garden, as climbing spinach loves the long, hot summer and only gets more lovely and yummy as the hot days drone on. It’s native to India, where its a staple in local cuisine. It’s a strong spinach taste, almost earthy, and is lovely added to a salad or used in cooking, like and omelette or stir-fry. Some have reported it’s a little too strong for them, but I think that we’ve only forgotten what real, fresh from the earth veggies taste like. Beets beat meat. While you’re waiting for your beets to come into their own underground, the greens make a lovely contrasting texture in the flower bed and I have found that beets do just fine in part sun. You can grow them in part shade, even, where the beets may not get as robust, but the greens stay small and tender and are a real treat in a salad. You have your own little micro-greens growing in the flower bed. ‘Chioggia’ Beets in the flower bed, contrast nicely with ornamentals. ‘Chioggia’ beets are an Italian heirloom veggie from the mid-1800s. While you wait for the red and white striped, mild darlings (they look a little like one of the striped hard candy mints), you can enjoy the burly leaves. Swiss chard is just loaded with vitamins, especially Vitamin A.– one cup of it gives you 40% of your daily recommended amount. The ‘Rainbow’ mix, which I believe is actually a blend of red, golden and Swiss chard is a standout in the garden border and boosts the face value of any patch its planted in. It’s spinach-like, though it stands up to the heat of summer better. That said, it does well to be a little shaded and if you plant it among ornamental grasses, it gets a little relief with the shade cast on it. It takes a good amount of shade and it’s color is a little beacon in the garden. 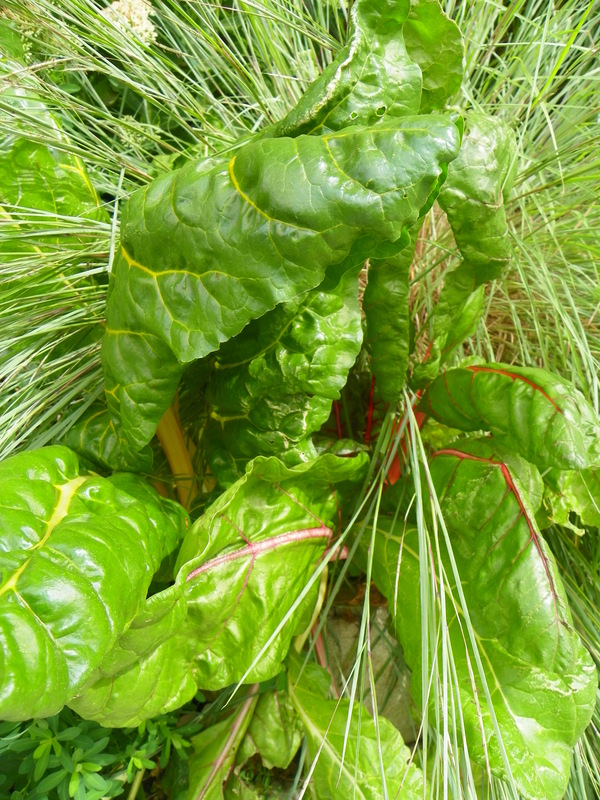 ‘Rainbow’ Swiss chard is lovely to look at, delightful to eat, and a star of any space you plant it in. It loves sun, but takes a lot of shade. I believe a garden-grown cauliflower has a taste completely different than a store-bought one and the best part of growing them out front and center is the unfurling of the head as it grows. It is pure garden theatre. It’s magical. Cauliflower will grow in full sun, part-sun and part-shade. ‘Grafitti’ cauliflower is the purplest of the purple cauliflowers. 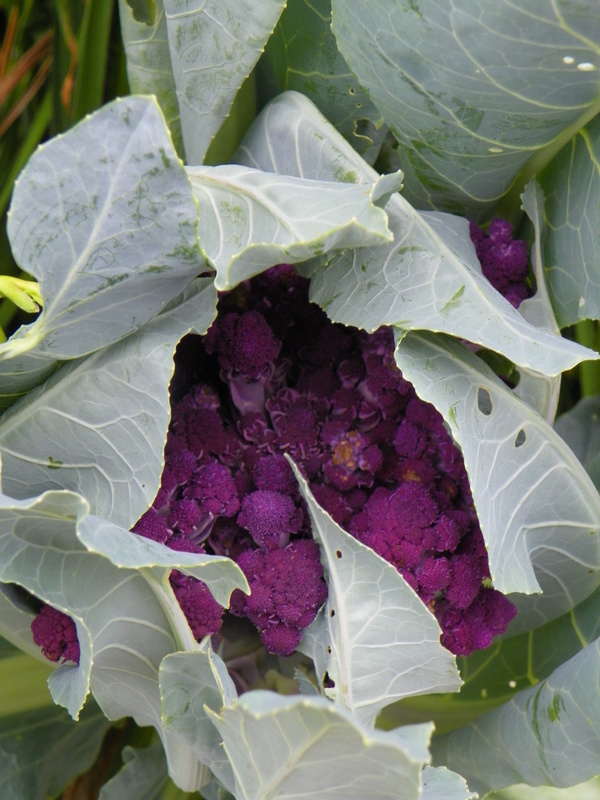 Grow it in the front border, name it the magic purple cauliflower, and the kids will flock and get turned on to gardening. Tomato-growing rivals baseball as everyone’s favorite summer sport. If your front yard is where the sun is at, then you need to be growing your tomatoes there. People ooh and aaah at the site of tomatoes — they’ve got the face value of any flower you could name. If you still aren’t convinced, try one of the new brightly painted tomato cages you see at the stores. In a nutshell, tomatoes need sun, sun, sun. Consistent watering and a good base of organic matter and well-drained soil also set you up for success. Be proud of your tomatoes and don’t hide them in the back behind the wood pile. Get them out front and center. Go to my website to read my full article on tomato growing and get out there, full-frontal and grow, grow, grow. The ‘Paul Robeson’ tomato is a Russian heirloom that is one of the prettiest tomatoes I’ve seen as it comes to ripen in the garden. 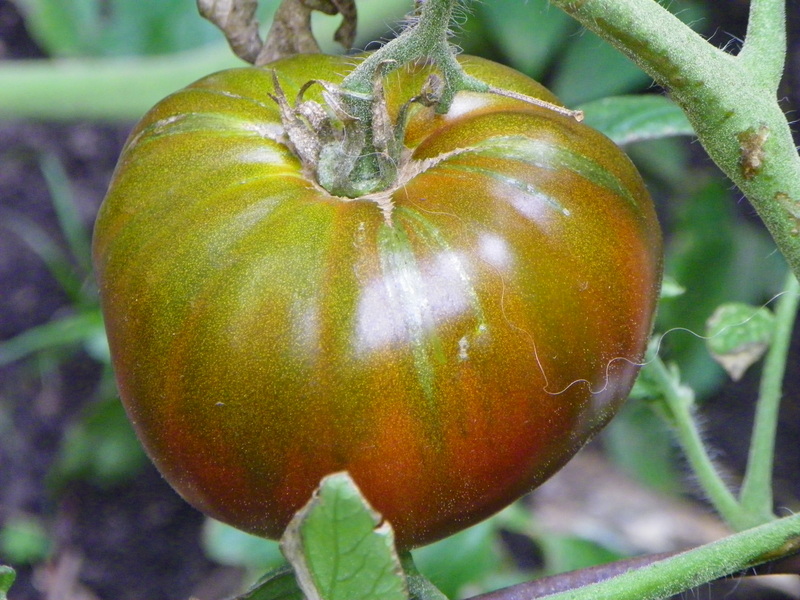 Named after the actor and civil rights activist who was a friend of Russia, the tomato is a yummy beefsteak that is as gorgeous as it is tasty. Loved your full frontal vegetable gardening article!! I can hardly wait to see and hear your presentation of it at the 2014 Spring Fling on March 8th at Wdbry H.S! You artical is educating and unique and I’ve enjoyed reading it. Thank you for sharing your adeas, Im adopting them.